Artist retreat log cabin brick and stone home on 200 acres in Artisan Community of Berea Kentucky – I am always telling you this is unique and that’s interesting and everything because we get these really unique listings, which are pretty unique. You don’t see them every day. This Artist Retreat on 200 acres is even wilder and I will tell you why. First of all, you are only 10 min to Berea Kentucky. It is an arts and crafts town. A lot of artists live here, of course. So you’re right on the edge of Appalachia – so it’s got all that kind of interesting stuff and then the arts community. So it’s like 10 min. away and then another 5 min. and you are at the I-75 interstate. Now how interesting is that so you’ve got two interstate exits on I-75 you are close to Richmond which is the home of Eastern Kentucky University. 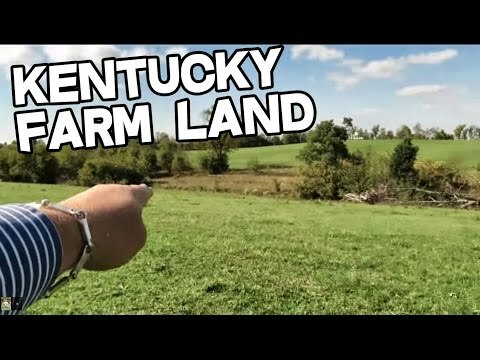 You are also very close to Lexington, Kentucky, which has a real airport. Artist retreat log cabin brick and stone home on 200 acres in Berea, Kentucky. So you’ve got a lot of flowers you are up here you got a lot of deer also a lot of turkeys and turkeys can fly right over top of that fence that’s nothing. Anyway you got beautiful evergreen trees and this great entrance gate and all the trees are amazing. So you’ve got a beech here and you’ve got Maple and you’ve got Oak and you’ve got shag-bark hickory and you’ve got sassafras and there some pine here. So anyway it’s all beautiful gorgeous hardwoods and of course there’s some poplar. In fact, these two are poplar this V is poplar trees – big, beautiful blooms in the spring. Can you imagine the colors in the fall? 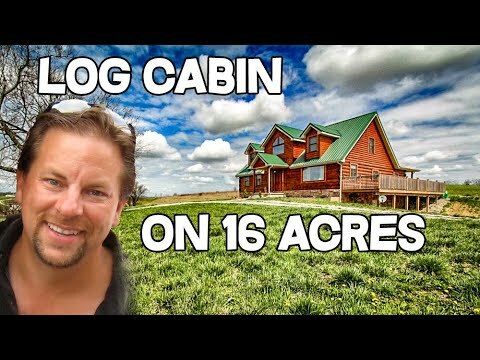 This is a special Artist Retreat, log cabin for sale on 200 acres. Anyway I’m going to show it all to you. The views are 15 miles + as the crow flies and if I’ll show you underneath the pertinent information because I don’t script this. We just talk because you know we are like friends. So I just talk if I’m off I will put it right here, but it’s about 5000 ft.² and it’s got three heat pumps. So that’s really popular here it’s a great way to heat your house. But it also has a stove inside a woodstove but it’s an awesome wood burning stove – I will show it to you later. If you know what a tulikivi is it’s just like a tulikivi. if you don’t know what a tulikivi stove is look it up and you can see exactly what the deal is, it’s so big lot of thermal mass once you heat it’s up it stays hot for a long time so there is about 4 or 5 acres that are fenced in did I tell you that already? and you’ve got picnic areas and play houses all kinds of adventures for the kiddos in the house. They have a large family and now are not needing this big of a house because the family is grown – so and so forth. You just want a big Log Cabin for sale in Kentucky? This is amazing for you. But if you want a family compound where everybody can come all the kids and grandkids and all stay here or maybe you are taking care of some family members. This is the place and lots of privacy can you imagine an Artist Retreat, log cabin for sale on land – 200 acres and be smack-dab in the middle. It’s real early in the spring in here but you can see lettuces and spinach and things coming up and lots of flowers. So this is going to be gorgeous you see all of the tomatoes cages there is all tomato plants in here this one got basil in it so it’s going to be great. I love the tomatoes and basils as far as I’m concerned we could have all tomatoes and basil garden right. This porch is ginormous – I just measured it off about 12 feet and then of course it wraps around the whole house the brick work there is quoins on the corner so beautiful but this is kind of unique remember we talk about it being an artist community well these people are artists so inside is very funky and that’s what that’s what gives it so much personality. I see so many houses they are all identical or there are just sheet rock and carpet and tan and beige and off white and this house is quite the opposite. So let me just come over here on this side first and show you. You got 2+ car garage here and then we got a big barn down there with heart stove and everything and I’ll show you later up top but look at the view out there you can see all the way at night it’s just stunning and Berea the artist community is right down there about 10 min. 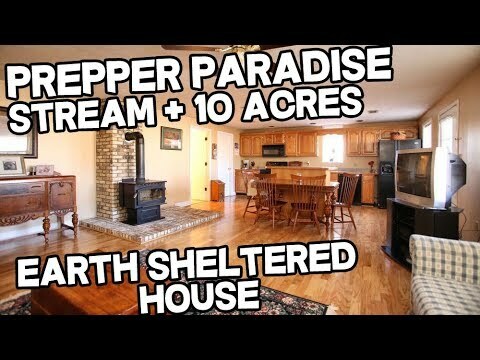 Before we go in I am going to go in right now but before we go in I want to tell you also we have 4 – 5 acres around here fenced and then there is 3 to 4 miles of hiking, jogging trails, horseback riding four wheeling, or whatever you want. These people are very into fitness. So they are running and jogging through 3 to 4 miles of trail that are cut and groomed and beautiful throughout all the property. Okay enough jibber jabber we are going in. From the second you walk in you going to tell that this place is special you’ve got logs here from the 1700 or 1800s all hand hewn, you got a reclaimed tin ceiling. So the seller is an engineer. So everything is done right. Everything is sturdy its built properly and Dan can tell you a lot more details about this property that I don’t know and of course we will hook you up with the seller and he can tell you, as we get farther down the track he would tell you story after story where all of these beams came from and so on and so forth really unique again – this is not a cookie-cutter house. This is this is special house. This house is built with love and you can see that. So here is the stove. Like a TULIKIVI. from Finland look it’s up and you will see what it is. This is not a tulikivi they had the artisans come down from upper Midwest they came down and built the inner workings and basically what it does is, is taking wood in instead of it going right up the chimney the idea is so that there is no heat that escapes of course obviously you are going to have some heat goes out of the chimney but it comes up and it’s going to go all the way down and around and up and down and heat all this stone for thermal mass and then after all of the heat is extracted then evacuate the smoke AND you get the bread oven and everything but the whole purpose of it is that it stays hot for days chimney goes right up through the center so it stays hot for days. So you don’t have to make a fire every day you’ll make a fire two three times a week so anyway from Finland tulikivi look it up. And that’s basically what you’ve got here. Again that’s a wrap around porch comes all the way around here and you got the French doors. So this is poplar, poplar would which is real common here in Kentucky and we got cherry right there transition look at that little niche. A nook a niche, a nicho – I don’t know what you want to call it. But this is cherry here this is all cherry. Nice big kitchen lots and lots of linear footage of cabinet and of course a great island. This came out of an old store down in Berea right the whole artist colony thing and then a big pantry, which there should be a light here yep big pantry got a little bar fridge. I need one of those that’s a great idea actually a bar fridge in there and an icemaker in the pantry. So in this door this goes out to the garage which is very nice, neat and clean. So this real quick there is a walk door there and then there is stairs you see the stairs that is to one of the apartments upstairs. So if you have you know maybe like a teenage child. I have got a teenager and it would be very cool for him to have his own pad l maybe you have a boomerang kid I mean there is just a thousand different reasons you would want a house this big with all of the apartments it’s just very cool it’s got two efficiency maybe just entertain. Like we do get friends from all over the world coming in how cool. This is the bath so you got everything you need right in the logs you never get tired of looking at that stuff. And by the way these beams are like 12 inch on center which is crazy. So again sturdy right the guys an engineer if you have any friends who are engineers you know exactly what I’m talking about right. They are little particular about things. Slates on the floor this is like roofing slate but this slate is like thick when you walk on it. You can feel everything like good quality. Now they’ve got grand kids. So this is like the ultimate family house right more stones right there you want unique this is about as unique as you are going to get. So you’ve got the bed there perfect guest room perfect and two doors out to the hot tub out there. Hot tub out there and the gym set here. The plays set how cool is that and that door goes right out to the deck where the gas grill is and everything. So again, perfect place for a guest room. Lots of books more books what did they say most people have large TVs smart people have large libraries where you got all the book rooms you need here a round window and brick on the outside and here’s one of the home offices there’s another home office upstairs too I’ll show that to you. You can sit here and do your work and watch the squirrels, chipmunks the deer and the turkey. Okay now one of my favourite spot is upstairs of course that dining room is hard to beat too. This part of the stove so you can imagine when that rascals get nice and cosy you don’t have a thing to worry about of course Kentucky is pretty easy as far as winters go that’s for sure. So you got a bedroom up here. This kind of a bedroom downstairs you know that guestroom bedroom. This goes out onto the second floor. This goes on to a huge deck here and it kind of see what’s going on here with the garage and then the views I will show you more later. Plumbing closets kind of need this is. I have got a pretty nice still photograph you could all look at the stove that’s pretty cool. Another bathroom and this, I love cherry but I love this pine too this is very serious pine is like is like two buy so it’s very sturdy .I will show you what that is later. Look at it hugh walk-in closet here. These people love this home – it is lovingly taken care of by an engineer and I mentioned that before I put it there and you can feel the family love I mean that sound kind of corny but you really can. I mean they have got three or four kids and you can just see things and you can feel a lot of laughter so lots of fun and good times over the years. Walk-in closet there big jet tub here. Shower right and then all of the light you ever need to put makeup on. Here is another fantastic bedroom and then this is like my favourite one. So you got a mural here you’ve got this stove here coming up you got log. And then you got this all of this reclaim repurposed wood here. Nice and cozy look at that. Another roof told you it’s done right. Look at now should I show you this first or this first I will show this first. So this floor I will tell you why if they ever come home and find this floor missing we are going to need to look at my house because it really is nice. My wife would go crazy over this floor. So you’ve got laundry room and then check this out. A full – on gym with water fountain. Little things little clues about these folks too – isn’t this place really taken care of? A water fountain in his gym yes think it’s probably taken care of. But wait till you see this. You know what this is sauna look at that oh yes, and it smells luscious in there all Cedar. Love that look at those floors I mean really look at those floors yeow. So here is another apartment remember in the garage and you just walk up the stairs and here you are so and so is this a great camp maybe a family artists camp maybe a hunting camp fishing camp whatever maybe it’s an occasion you use for someone who lives in Lexington who would like to travel to Lexington over 5000 ft.² five or six bedrooms and five bathrooms. I think there is enough room for your clan. Did I show you the bathroom no let me show you the bath? Yes it’s a small bath but it’s got everything you need all the stuff sure okay. And by the way, this is over the garage. See you call it a bonus room while the people call it a bonus to room over the garage but this room is really a super bonus . A full on gym, a sauna and an apartment so there is the stove again. This is my favorite part of the Artist Retreat. I was telling you this is it a little reading nook let’s see what’s in here more storage. Check out these this space will you is this coolest or what no doubt that came out of some really cool edifice somewhere. This would be my office right here. Pool table, foosball, Ping-Pong. Going outside so upon this third-floor I cannot tell you how nice this is. The views are amazing. I mean amazing you could have a telescope up here and scope out all kind of stuff. And that’s a lot of tin that tin would last a long long time. Lots of storage here lots of storage all kinds of things. If you’ve got kids can you imagine being a kid and being up here? It’s just got to be the coolest – pool table with your friends. Private look at this remember that bedroom downstairs where I was telling you about you can feel the family love in here, well that’s that window I think that’s just really cool detail. So that deck right there is the deck that’s off of that home office right there so this is an oak tree look how beautiful that is .… Okay let’s do the summary we got upstairs there is one more bathroom I need to show you another bathroom. There is another walk-in shower and copper in the sink. I really love this space. Maybe it choose me and then we got downstairs we got not not counting the gym or the apartment one two, three, four, five bedrooms here and a couple baths and then this what would you do with this is if you know what you would do would this room besides a guestroom give me some ideas put in a description I’d love to hear from you. So that could be like bedroom number six and count the apartment number seven and eight. I mean you can easily get up to eight bedrooms and 5 baths. 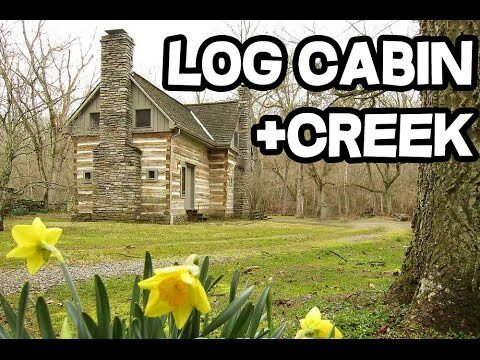 Neat place we aim to get you unique properties and this is one – a special place – Artist Retreat, log cabin for sale on land – 200 acres right in Berea, KY – call Dan, thanks for watching. Oh oh, let me show you the garage – hold on. So you got room for one car two cars and if you have a small car you put it over here definitely lawnmowers four wheelers that sort of thing. But we have a whole barn too so anyway so there is a RAV4 to give you an idea of the size of this rascal and they got stuff just like I have in my garage plus he’s got at least 2 feet there and a RAV4 and then enough room to put a for a prius so how many cars can you fit in here you’ll definitely fit three suburbans in here no problem. Okay so now we’re down we came out of the back of the house. Here’s where the garage is there where that dark car is and here is my car and there is the garage and it’s like a circular drive. So it goes around that way out by the entrance gate and l you can come down here and then you got this great barn. So you got upstairs and everything. So it’s got a little storage room here with stone floor and then the main part of the barn is awesome so got couple horse stalls you’ve got concrete here tons of storage up in the top and then they have got storage here, which should be normally like hay storage and we put anything up there and then it got more storage on top of that so it’s crazy. So you’ve got really high ceilings here I am going to guess it’s like 12 foot for a your overhead door 12 x 12 you can tack room here all electric place for your motors and whatnot and then woods splitter. They cut their own wood here you don’t have to. You don’t even have to cut wood. I mean you only have to burn wood right but if you wanted to you certainly got enough wood 200 acres. I guarantee you got enough trees that fall down and branches that break and stuff like that over throughout the year. You never have to cut a live tree. So brick on the floor here. Lots of recycled reclaimed stuff. But not only is that a green thing to do but also a nice thing to do. Also inexpensive and you also usually much sturdier and that’s what this house is about and this great barn about 36 x 36, 40 x 40 something like that. There is your riding trails. How cool is that beautiful beautifully groomed riding trails again? Again Thanks for watching call Dan phone number is right there go to our website. Tell us what else you want that’s this line up here and we will find the perfect place for you if this isn’t it , if this is give him a call and see what Berea is all about and see what this place is all about you are going to really, really be glad you did. Artist Retreat, log cabin for sale on land – 200 acres in Berea, Kentucky. Privacy! 200 acre wooded property with incredible views. Six bedroom home plus 1050 square foot studio apartment. Short distance to Berea – Call RE/MAX office 859-379-5263 Artist Retreat Log Cabin Stone and Brick for sale in Kentucky all on 200 acres – 4 miles of groomed hiking trails. HUGE Timber – timber is always been a good investment over the decades. go to “Your Perfect Property” at http://bluegrassteam.com/homefinder/ – it only takes a few seconds to fill out your needs and wants and we will start sending you properties that meet YOUR criteria.